Contestants will enter by filling out a form or comment which will request their name, e-mail address, and possibly other details like a trivia question or secret codeword. This form is used so that contestant details cannot be harvested. Your email address will not be stored for further use by myself or Dance Advantage. 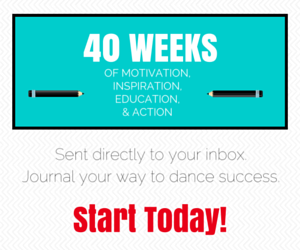 Subscription to newsletter communications are strictly opt-in at Dance Advantage through MailChimp. Nichelle Strzepek (Dance Advantage) is not responsible for what the publisher/company/service does with this information. Please refer to the company’s website for information and policies regarding privacy. Winners will be randomly chosen from all entries using random.org. Winners will be contacted via email and will have 48 hours to respond. If a contestant fails to respond the next random winner will be chosen and contacted. Winners will be announced when all have been confirmed. Prizes will be shipped to winners by the supplier (not by Dance Advantage). Shipping times may vary. However, if you do not receive your product in the time allotted, please contact me so that I can work with the supplier to remedy the issue. Please note that I, Nichelle Strzepek (Dance Advantage) am not responsible for the companies that are mailing out prizes, nor the condition in which said prizes arrive. DanceAdvantage.net makes no representations as to accuracy, suitability, or validity of any information on this site and will not be liable for any errors, omissions, or delays in this information or any losses, injuries, or damages arising from its display or use. All information in this blog is provided AS IS with no warranties, and confers no rights.. I run the contests and promotions and I also choose the winner via random.org. If you DO have issues with the condition or quality of your prize, I would like to know about it – you may contact me at any time. Unless otherwise noted, the various publishers and/or companies are responsible for sending your prize to you. Please be patient with them. If I am the one sending out the prize I will email you the day that package is sent out. Again please be patient, I will do my best to get the prize out days after I get your information. Additional entries can sometimes be earned. These will be determined according to each individual contest and described in the giveaway post. Do any, do none, do them all — it’s your choice how many and in what order you submit. For each task you complete, you’ll be asked to submit a separate entry form. Yes, you must fill out all three of the required (*) fields again. This is the only way to ensure that your extra entries will be counted in the giveaway. Be or become a subscriber. If you are already an email or feed subscriber, no need to subscribe again. You may be given a secret password or urged to offer verification of your membership with an email address. New subscribers are typically eligible for most giveaways. Tweet about the giveaway. You’ll be asked to copy and paste a particular message that will make it easy for me to find your tweet. And, you’ll need to provide your Twitter user name for confirmation purposes. Mention this giveaway or review on your website or blog. Link to or write about the giveaway in a post or page on your website and provide the URL where the link can be found. An initial entry to a giveaway will always be easy – submitting basic info, placing a comment on the post, etc. Extra tasks (like those above) will be optional opportunities to increase your chances of winning.